Dayton was the son of Comfort Newbury and Nancy Collins. No further ancestry is known at this time. Elizabeth's ancestry is unknown at this time. Caroline first married Caleb Perry of Troy NH. Their daughter Caroline Abigail Perry married Orrin Clark Jillson, brother of settler Sylvester Weeks Jillson. Lydia was the daughter of William Parkes and Catherine _______. No further ancestry is known at this time. Descendants of Dayton Bill Newbury. 1. DAYTON BILL2 NEWBURY (COMFORT1) was born 07 Apr 1803 in Mansfield CT, and died 25 Mar 1871 in Waterford WI. He married (1) ELIZABETH FOSTER 22 Dec 1829 in Springfield MA. She was born Abt. 1808 in CT, and died 17 Jun 1842 in Gardner MA. 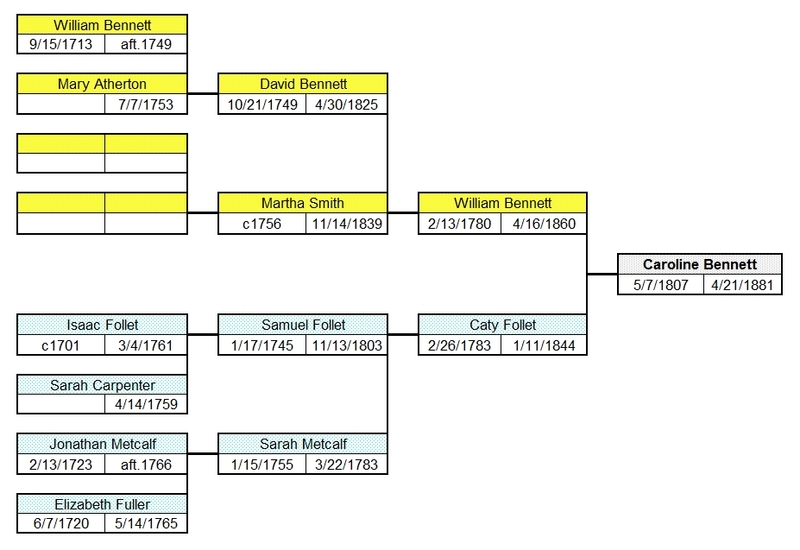 He married (2) CAROLINE BENNETT 15 Sep 1843 in Hubbardston MA, daughter of WILLIAM BENNETT and CATY FOLLET. She was born 07 May 1807 in Hubbardston MA, and died 21 Apr 1881 in Hubbardston MA. He married (3) LYDIA PARKES 06 Oct 1855 in Salem WI, daughter of WILLIAM PARKES and CATHERINE ?. She died Aft. 1855. 2. i. ALBERT3 NEWBURY, b. 25 Oct 1831, Springfield MA; d. 09 Feb 1873, Worcester MA. ii. HARRIET E NEWBURY, b. 09 Oct 1833, Uxbridge MA. iii. GILBERT B NEWBURY, b. 05 Aug 1835, Gardner MA; d. 07 May 1848, Gardner MA. iv. DWIGHT NEWBURY, b. 11 Mar 1838, Gardner MA; d. Bet. 1861 - 1865; m. LYDIA ALEXANDER, 18 Apr 1861, Worcester MA; b. 16 Apr 1829, Warwick MA; d. 19 Sep 1915, Worcester MA. v. BENJAMIN FRANKLIN NEWBURY, b. 02 Jun 1840, Gardner MA; d. 22 Sep 1843, Gardner MA. 3. vi. MARIA AMELIA NEWBURY, b. 12 Jun 1842, [6/7/1842??] Gardner MA; d. Aft. 1920.
vii. SON3 NEWBURY, b. 23 Jul 1844, Gardner MA; d. 28 Jul 1844, Gardner MA. viii. ADELAIDE M NEWBURY, b. Jun 1846, Gardner MA; d. 19 Aug 1846, Gardner MA. ix. LUCIUS E NEWBURY, b. 24 Oct 1847, Gardner MA; d. 27 Sep 1848, Gardner MA. 2. ALBERT3 NEWBURY (DAYTON BILL2, COMFORT1) was born 25 Oct 1831 in Springfield MA, and died 09 Feb 1873 in Worcester MA. He married SYBIL S JOHNSON 14 Sep 1853 in Northfield MA. She was born Dec 1829 in Northfield MA, and died 11 Sep 1901 in Worcester MA. 4. i. MARY E4 NEWBURY, b. Jun 1854, MA; d. Aft. 1920. 5. ii. CORA ALMIRA NEWBURY, b. 16 Jul 1858, Worcester MA; d. Aft. 1940. 6. iii. CLARA LOUISA NEWBURY, b. Apr 1864, MA; d. Aft. 1940.
iv. DELIA ISABEL NEWBURY, b. 22 Oct 1865, Worcester MA; d. 15 Jul 1903, Shrewsbury MA; m. WILLIS EVERETT KNOWLTON, 29 Nov 1888, Worcester MA; b. 18 Sep 1857, Dorchester MA; d. Aft. 1920.
v. SON NEWBURY, b. 22 Oct 1865, Worcester MA. 3. MARIA AMELIA3 NEWBURY (DAYTON BILL2, COMFORT1) was born 12 Jun 1842 in [6/7/1842??] Gardner MA, and died Aft. 1920. She married GEORGE A GROAT 18 Mar 1862 in Rochester WI. He was born Abt. 1841 in NY, and died Aft. 1880.
i. ELLA4 GROAT, b. Abt. 1863, WI; d. Aft. 1870.
ii. MARY GROAT, b. Dec 1873, WI; d. Aft. 1900. 4. MARY E4 NEWBURY (ALBERT3, DAYTON BILL2, COMFORT1) was born Jun 1854 in MA, and died Aft. 1920. She married HENRY FRANCIS STEDMAN 21 Apr 1875 in Worcester MA. He was born 05 Aug 1842 in Worcester MA, and died 25 Aug 1911 in Worcester MA. i. ALBERT HENRY5 STEDMAN, b. 22 Mar 1876, Worcester MA; d. Aft. 1900.
ii. AMY G STEDMAN, b. Dec 1882, Boston MA; d. Aft. 1920; m. WILLIAM J POLLARD, 09 Nov 1911, Worcester MA; b. Abt. 1882, MA; d. Aft. 1920. 5. CORA ALMIRA4 NEWBURY (ALBERT3, DAYTON BILL2, COMFORT1) was born 16 Jul 1858 in Worcester MA, and died Aft. 1940. She married FRED E ADAMS Abt. 1882. He was born Feb 1856 in MA, and died Aft. 1940.
i. DAUGHTER5 ADAMS, b. 11 Oct 1882, Worcester MA. 7. ii. ERNEST NEWBURY ADAMS, b. 19 May 1889, Worcester MA; d. Aft. 1940. 6. CLARA LOUISA4 NEWBURY (ALBERT3, DAYTON BILL2, COMFORT1) was born Apr 1864 in MA, and died Aft. 1940. She married FRANK E OSBORNE 07 Nov 1883 in Worcester MA. He was born Oct 1859 in NY, and died Aft. 1940. 8. i. RALPH ALBERT5 OSBORNE, b. 21 May 1886, Worcester MA; d. Aft. 1917.
ii. SYBIL PAMELIA OSBORNE, b. 22 Mar 1895, Brooklyn NY; d. Aft. 1920. 9. iii. FRANK RONALD OSBORNE, b. 29 Jan 1898, NJ; d. Aft. 1940. 7. ERNEST NEWBURY5 ADAMS (CORA ALMIRA4 NEWBURY, ALBERT3, DAYTON BILL2, COMFORT1) was born 19 May 1889 in Worcester MA, and died Aft. 1940. He married AMY L TOWNSEND 06 Nov 1912 in Worcester MA. She was born Abt. 1890 in MA, and died Aft. 1940.
i. PHILLIP TOWNSEND6 ADAMS, b. 15 Oct 1913, Worcester MA; d. 20 Oct 1913, Worcester MA. ii. PRISCILLA ADAMS, b. Abt. 1916, MA; d. Aft. 1940. 8. RALPH ALBERT5 OSBORNE (CLARA LOUISA4 NEWBURY, ALBERT3, DAYTON BILL2, COMFORT1) was born 21 May 1886 in Worcester MA, and died Aft. 1917. He married ? ?. She died Aft. 1917. 9. FRANK RONALD5 OSBORNE (CLARA LOUISA4 NEWBURY, ALBERT3, DAYTON BILL2, COMFORT1) was born 29 Jan 1898 in NJ, and died Aft. 1940. He married JEAN E ?. She was born Abt. 1897 in Canada, and died Aft. 1940.
i. MARJORIE LOUISE6 OSBORNE, b. Abt. 1921, Canada; d. Aft. 1940.
ii. HARRISON S OSBORNE, b. Abt. 1923, NY; d. Aft. 1940.
iii. FRANK R OSBORNE, b. Abt. 1925, NY; d. Aft. 1940.